Why Knit Fabric Consumption is Calculated in Kgs and Woven Fabric in Yards? Question: Can you explain the actual reason why knit fabric consumption is calculated in kg and woven in yards? Is there any problem if we calculate woven consumption also in kg? In the apparel and textile trade, fabric consumption for the knits fabric is calculated in grams and kilograms. 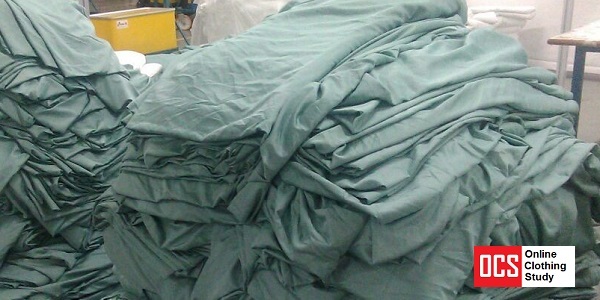 On the other hand, the fabric consumption of the woven fabric is calculated in the liner length like meters or yards. Now the question is why one type of fabrics (knits) are measured in Kgs and another type of fabrics (woven) are measured in meters/yards? In this post, I will explain the reason. Normally, woven fabrics are dimensionally stable. Woven fabrics don’t get stretched easily. So, the linear length of the woven fabric remains the same during the fabric handing and measurement. Also, the width of the woven fabric does not get changed. Therefore, when you purchase woven fabric of the desired length and specific width, you will get that. When you cut the fabric for your design, you would not get any issue like actual fabric length becomes shorter than the purchased one and fabric thickness changes (GSM) drastically too high or too low thickness. On the other hand, knitted fabrics get stretched easily in length direction as well as in width direction. When the fabric is stretched lengthwise, the width of the knitted fabric gets reduced. In such circumstances, if you buy knits fabric in length and supplier may measure the knits fabric by stretching it. Later when you open the fabric at your shop, you will see the actual length of the fabric is shorter than the purchased length. Because when the fabric is relaxed, it releases the tension and fabric and you get less fabric than the requirement for your design. In bulk knit fabric sourcing, measuring the knits fabric in linear length is also a difficult job compared to woven fabric as with a little tension, the fabric gets stretched. Therefore, accuracy in measuring the knits fabric length is not possible. That is why in trading of knits fabric not done in linear length. When rolling of knits fabric is done, the knits fabric gets stretched. Therefore, purchasing knits fabric in length is not a good idea. In case you are a beginner, it would be difficult to understand how much fabric is required in kilograms for making your design like, a t-shirt or a polo shirt or leggings. As you will have body measurement of the garment in linear length and you may not know how to convert the length into Kgs. You may not be aware of the GSM factor of the fabric. If you need only 1-2 yards fabrics, in such cases you can buy the knits fabric in linear length. This is the reason for trading and purchasing of knits fabric is done in Kgs. As you will purchase the fabric in Kgs, fabric consumption is measured and expressed in Kg s or grams only. Like, the fabric consumption of a typical t-shirt is 230 grams for 160 GSM quality. The woven fabric consumption is measured in length (yards or meters) as it is stable in a dimensional structure. For an example, for a formal shirt, the fabric consumption is 2.25 meters. Though you can use the following method for converting fabric requirement from Kg to meters /yards and can convert from meters/yards to Kgs. Read these posts for the conversions. How to Convert Fabric Price from per Yard to per Kg? Online Clothing Study: Why Knit Fabric Consumption is Calculated in Kgs and Woven Fabric in Yards? Different unit of measure are used for the woven and knitted fabrics. Consumption of knits fabrics in grams and woven fabrics in linear yards or meters.